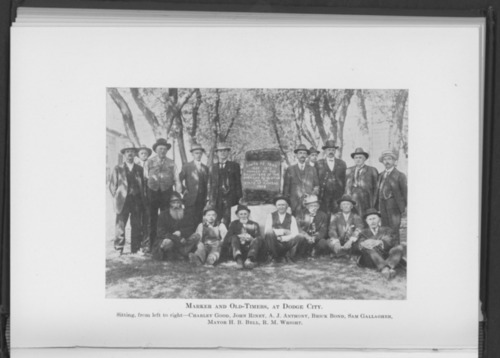 This photograph from the book, "Marking the Santa Fe Trail", shows a group of men standing beside the granite monument erected by the Daughters of the American Revolution and the state of Kansas in Dodge City, Kansas. The individuals in the front row have been identified as: Charley Good, John Riney, A.J. Anthony, Brick Bond, Sam Gallagher, Mayor H.B. Bell, R. M. Wright.